Easter Greetings to all members and friends of Silvermines Historical Society. This year’s Easter dawn Mass was celebrated at 6 am on Easter Sunday in Dolla cemetery beside the old Church in Kilboy. As dawn approached a large congregation made their way through the open gates and crossed the stream to the graveyard where an Easter fire burned bright, lighting up the way. Mass was celebrated by Rev Brendan Moloney,PP and the Silvermines Folk Choir were in fine voice. It was a special occasion where, parishioners came together in this historic resting place of their ancestors. 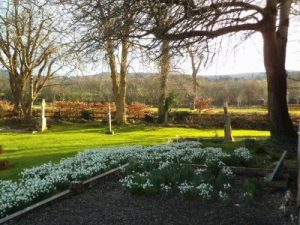 See attached photo taken earlier when the snow drops were in full bloom.